RICHLAND, Wash. – The U.S. Transuranium and Uranium Registries, operated by Washington State University, will sign a memorandum of understanding with Kyushu Environmental Evaluation Association of Japan on Tuesday, May 16, at WSU Tri-Cities in Richland to partner for research opportunities, student experiences and the general sharing of knowledge. KEEA’s radioanalytical section has been involved with Japan’s environmental monitoring following the 2011 accident at the Fukushima Daiichi nuclear power plants. The purpose of KEEA is to contribute to the conservation and maintenance of the environment in Japan, and protect the health and life of the local community. In addition to signing of the memorandum of understanding, representatives from KEEA will tour the U.S. Transuranium and Uranium Registries (USTUR) facilities in Richland and discuss collaboration projects, in addition to current and future research efforts. Sergei Tolmachev, director of the USTUR, said partnering with KEEA presents a great opportunity for the global sharing of knowledge and research. 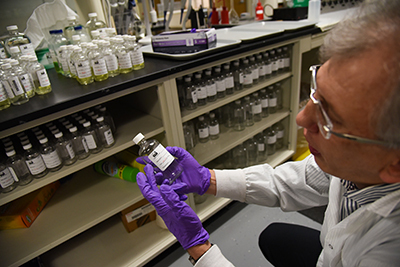 WSU’s USTUR is a research program that studies actinide elements, such as plutonium, americium and uranium, that have been deposited within the human body – more specifically in persons with measurable, documented exposures to those radioactive elements. Noriyuki Momoshima, president of KEEA, said his organization is excited about learning the techniques on radiochemical analysis of transuranium elements in humans from the USTUR. Tolmachev said the USTUR will benefit from sharing testing materials that will allow them to broaden their scope of research, as well as provide them with additional testing capabilities for projects that have been put on hold due to larger-scope projects.